So, who am I? Well, it’s hard for me to put into words who I am–yes, even this verbose word-queen. I don’t stop to dwell on it, I just do it, be it, AM it. Short version…..I’m a retired elementary school teacher who has found her passion in encouraging and empowering others, speaking life to prompt change for the positive, and just being a bit of joy and love to the many lives I touch! 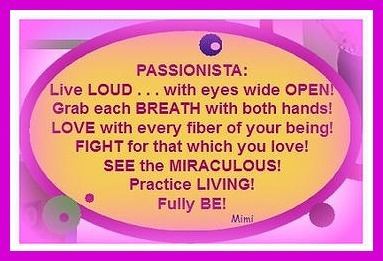 In my business, Passionista At Large, I speak to groups, write on here and in several published places, and design cards for my positivity greeting card line, Empowordment Cards by Mimi. *I’m an educator at heart–it’s in my blood. From an early age, if I learned it, I told it. Always curious, asking why, learning and sharing. It’s what I do. *I’m a highly emotional person. Lately I’ve identified that as “passion”, and that it’s a good thing. I care deeply about many things–that is also “passion”. *I’m a late-life mom to two amazing and adorable children who have physical, mental, and psychological differences from “typical” children. *I’m in my “Sensational Sixties” and a bit of a crazy woman. *I love to tell a good story–so I’m writing to see how those stories come out. I hope you enjoy them, and learn something along the way. Please visit my website http://www.passionistaatlarge.org/ to see more about me, and perhaps invite me to speak for your group! Join my Facebook pages too! Your writing is wonderful Mimi! Love this poem! After reading your latest post and now your “Hi There” I have come to the conclusion that you are an incredibly beautiful lady inside and out. A true lady in my opinion shows great kindness and compassion, she is empathetic and reaches out speaking for those unable to speak for themselves, a beautiful lady does all of this with grace, that is you Miss. Mimi. I look forward to reading your posts, it will be a privilege. Hi Mimi! I’m Tracy ,male,63yrs. I’m writing you to tell you I read the poem:Fly. Now it is in my list of favorite poems. Really like your poem. Also,although,I enjoy poetry ,I have never before written any. Lately I have tried my hand at it. So far just 3. I was wondering if you may have a few suggestions as to how I might learn to write poetry well? Any help would be appreciated. Thank you Tracy. I appreciate the compliment. Unfortunately I have no ideas as to HOW to write poetry, because my poetry just comes from my heart when it’s there. I would suggest that you write a lot which is what I do. All the time. Get used to using words. Put your feelings into words every day. Use descriptive words. As you see, my poetry doesn’t rhyme, it just expresses feeling. Good luck.